Microsoft has released an update to what was known as the Phone Insider app for Windows Phone. The now Windows Insider for Windows Phone app is essentially the same app with a new name but clearly prepares the way for Windows 10 to come to your phone in February. the Windows Insider program – it unifies it all. One thing that has changed is that you can now login with your Microsoft account (the one that you registered when you signed up for the Windows Insider program). 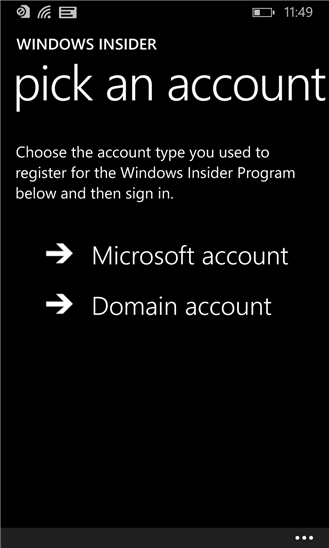 In the old Phone Insider app you could only sign in with a Microsoft domain account. Right now there are no new apps through the Windows Insider for Windows Phone app. It’s essentially a place holder for what will be coming next month. However, if you are going to want to try Windows 10 on your phone you will need to be in the program and have this app installed on your Windows Phone(s). The app is free as is the Windows Insider program. Remember though: Windows 10 is still in beta so you will likely run into bugs and apps that don’t play nice.